“Having a lot of glasses can be a hassle. Thanks to Shadecase, it gets a whole lot easier.” – Kevin Harrington, Shark Tank. Transport your favorite eyewear in style with the ShadeCase. This innovative glasses carrier makes it easier to store and protect your favorite pairs of sunglasses and eyeglasses. Designed for everyday use and stylish aesthetics, this is both a trendy and functional way to keep your valuables safe and protected. The ShadeCase was designed from the ground-up to be the definitive sunglasses case. Made with a soft foam core and a hard, leather-like outer shell, this caddy both makes a fashion statement and protects all at once. Add convenience to your storage options. This eyewear carrier allows you to take two of your favorite frames wherever you want! Life is full of unexpected surprises. Roll with a carrying case that’s prepared for virtually anything. The ShadeCase is portable and accessible, with a zipper enclosure that keeps water out. The carrier’s hard exterior resists drops and impacts with ease. As a result, your favorite eyewear will travel with you without any scratches or breakage. The compact form-factor of the ShadeCase also means that it can go anywhere and fit anywhere. Store it in your daypack or leave it in the car. A portion of your eyewear collection is ready to go. Preserve your sight with total confidence. The ShadeCase provides the protection your accessories need. The ShadeCase makes a great gift. Each sunglasses carrier is assembled using high-quality materials. On top of that, each carrier is sensibly priced. It’s a great product for people of all ages and lifestyles. It’s a great solution for keeping your eyewear collection in one place. People who are frequently on the move appreciate this glasses carrier for its ease of use. 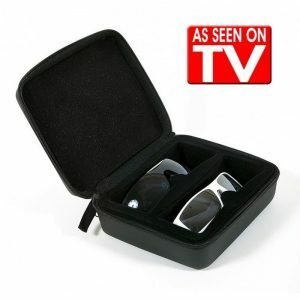 Patented in 2010, the ShadeCase has been a proven solution for storing all types of eyewear and even smaller valuables. Its performance has also been tried, tested, and approved by the Shark Tank. This New Patented portable compact leather type case allows you to safely store 2 pairs of sunglasses in your automobile or home without scratching or damaging them.